Con Alma understands that health is more than healthcare. As such, the Foundation’s grants reflect a diversity of strategies and issues that affect people’s physical, mental, emotional, behavioral, social, oral, environmental, economic and spiritual well-being. 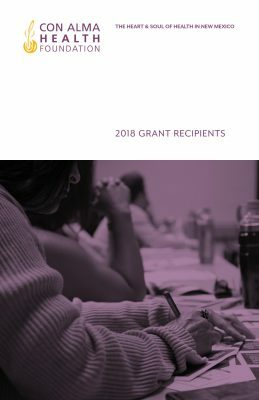 Our 2018 grants support efforts involving such issues as health-care access, environmental health, suicide prevention, affordable housing and economic development. Grants also expand education and care for populations that need extra support, including people with disabilities, uninsured patients, caregivers, homeless and at-risk youth. Nonprofits receiving grants serve people statewide and specifically in Bernalillo, Catron, Colfax, Doña Ana, Grant, Lea, Lincoln, Los Alamos, Luna, McKinley, Otero, Rio Arriba, San Juan, Sandoval, Santa Fe, Sierra, Socorro, Taos, Torrance, Union and Valencia counties. Through our 2018 grant cycle, we have awarded 43 grants totaling $665,000. Follow the links below to learn more about this year’s grantees. Whether through the Foundation’s grantmaking, partnerships, research or reports, Con Alma serves as a catalyst for positive, systemic change. The emphasis of our grantmaking is on attaining long-term policy solutions and health equity.